Examples of special projects undertaken though P&D include beautification and special studies (e.g., Gravel Pit Study). Municipal District of Fairview No. 136 works closely with the Mackenzie Municipal Services Agency to implement its land use planning framework. The MD of Fairview is currently working on Intermunicipal Development Plans (IDPs) with the Town of Fairview, the Municipal District of Peace No. 135 and the Clear Hills County. The three IDPs are at different stages of development and will be made available online once completed. There are no up-coming public hearings at this time. 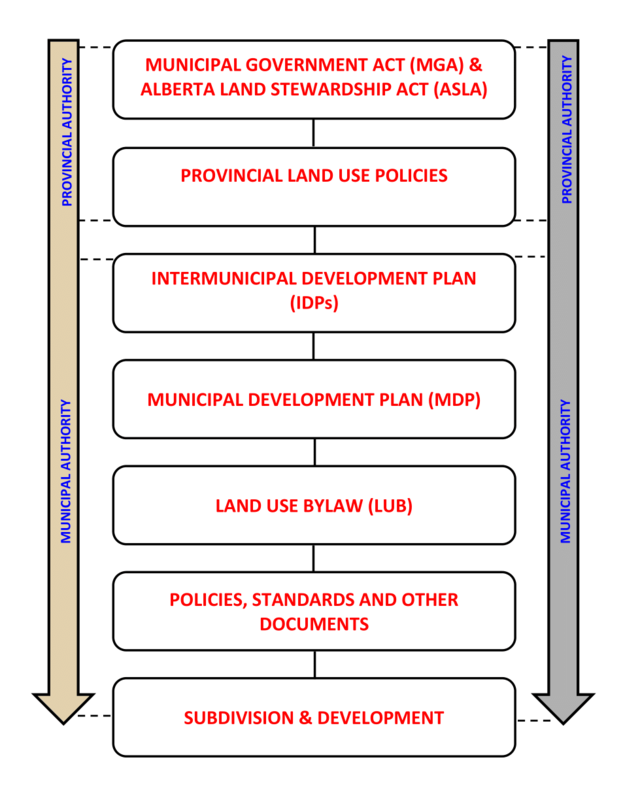 Together with the Province’s MGA, ALSA, Land Use Policies and Subdivision and Development Regulation, and the MD’s statutory plans, Land Use Bylaw, Policies, and other documents, the land use planning framework serves as a guide for planning, development and subdivision within the Municipal District of Fairview No. 136. Following is a description of and link to these documents. Some of the MD’s documents represent Office Consolidations that incorporate the original documents and subsequent amendments approved by Council by bylaw. In case of uncertainty, the reader is advised to consult the original documents, available at the MD’s municipal office in Fairview. The hierarchy of documents within the MD of Fairview No. 136’s land use planning framework is established by the MGA. The MGA requires that each level is consistent with the level above and below it, and that the policies or regulations within planning document(s) at each level may be implemented by those below them in the decision-making process. The MGA provides the legislative authority for municipal land use planning and decision-making, while the ALSA regional plan (or Land Use Policies in their absence) provides broad-based policy directions and principles for municipal land use planning, which are effected through statutory plans and bylaws. The statutory plans provide future direction for the development and use of lands at the fringe areas of the MD’s boundaries (IDPs) or within the whole municipality (MDP). The LUB regulates the use and development of land based on the policy directions of statutory plans, while the Subdivision and Development Regulation regulates subdivision planning in conjunction with the MGA, applicable statutory plans, and the Land Use Bylaw. The polices, studies, guidelines and other documents contain additional information or specific requirements outside statutory plans and the LUB documents that are considered for certain types of development permit and subdivision applications. Where there is a conflict or inconsistency between a higher-level planning document and a lower-level planning document, the higher-level planning document prevails to the extent of the conflict or inconsistency. The Municipal Government Act is the key provincial legislation from which the Municipal District of Fairview No. 136 derives its authority to undertake planning and development. The MGA establishes the powers and responsibilities of Council and administration in creating policies, plans and bylaws to regulate land use and development within their municipality, to ensure orderly physical, environmental and economical beneficial development. Specifically, the MGA allows a municipality to create four (4) types of statutory plans—namely, Municipal Development Plan (MDP), Intermunicipal Development Plan (IDP), Area Structure Plan (ASP) and Area Redevelopment Plan (ARP)—and the Land Use Bylaw. These provide a framework for coordinated land use planning and decision-making. The MGA also provides municipalities with enforcement mechanisms to ensure conformity between development and approved plans and bylaws. 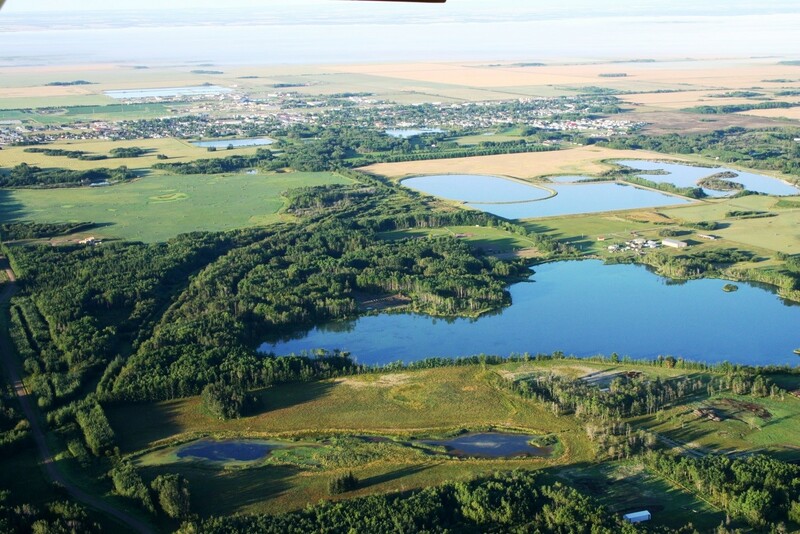 The Alberta Land Stewardship Act (ALSA) is a 2009 provincial legislation that establishes a regional approach to land use planning through the implementation of the Alberta Land-use Framework (LUF). It aims to achieve Alberta’s long-term economic, social and environmental goals through the efficient management of public and private lands and natural resources. The ALSA divides up the province into seven “land-use regions”, based on the LUF, which correspond to Alberta’s major watersheds, and contemplates a regional plan for each region. Municipal District of Fairview No. 136 is located within the Upper Peace Region. Once adopted, the Upper Peace Regional Plan will provide high-level policy direction for land use planning and decision-making within the MD of Fairview No. 136. An applicant for subdivision or development permit (except when the proposed building is less than 47 square metres) is also required by the Subdivision and Development Regulation to supply information regarding abandoned oil and gas wells on the subject parcel. If an abandoned well is identified during the application process, Alberta Energy Regulator Directive 079 (Surface Development in Proximity to Abandoned Wells) prescribes minimum setbacks and may require the applicant to contact the licensee of record. An Intermunicipal Development Plan (IDP) is a statutory plan prepared collaboratively between two (or more) municipalities to provide direction for the future development of the lands of mutual importance. An IDP serves as a cooperative framework for efficient land use planning and development decision-making at the interface between municipal boundaries. IDPs are adopted by the municipalities party to them through marching municipal bylaws, and contain policies that address land use, environmental matters, transportation, economic development, and intermunicipal infrastructure, services and programs, as well as procedures for administering and amending the plan. All IDPs will have to be consistent with the ALSA Regional Plans of the Provincial Land Use Framework, once those are completed. Municipal District of Fairview No. 136 shares boundaries with six municipalities, one urban and five rural. The MD’s urban neighbour is the Town of Fairview, while its rural neighbours include: Municipal District of Peace No. 135, Clear Hills County, Saddle Hills County, Municipal District of Spirit River No.133 and Birch Hills County. Previously, IDPs were not required under the MGA; they were only developed when neighbouring municipalities agreed to adopt one. However, under the amended MGA, IDPs are now mandatory for all municipalities that share a common boundary, unless they are part of a growth region, or have been granted an exemption from the requirement of adopting an IDP by the Minster of Municipal Affairs. To comply with the MGA, the MD of Fairview No. 136 is currently working on several IDPs with some of its neighbours. Opportunities for public input will be provided in the process of developing these IDPs. The IDPs will also be made available publicly and online once completed and adopted by Council. The Municipal Development Plan (MDP) was adopted by in 2008 by Council to provide a cohesive framework to guide local decision making that is necessary to achieve the Municipal District of Fairview No. 136’s long term vision. The MDP guides future land use, infrastructure, environmental, social and economic policy decisions in a manner that reflects the municipality’s vision. The MDP was also developed to protect the MD’s agricultural land base, rural character, and unique natural features, while promoting its tourism and development potential. The MDP is also aimed at promoting residential, commercial and industrial growth through sustainable and efficient development practices and standards. The guiding principle of the MDP is that all future growth in the MD will occur in an orderly, efficient and economically sound manner. This will be accomplished by efficient land use patterns, protection of agricultural land and natural environment, and provision of municipal infrastructure. The Land Use Bylaw can be described as the “rule book” for development within the MD of Fairview No. 136. It regulates the development of land and buildings on a site-specific basis, based on the policy directions set by the MDP and IDPs. The LUB defines what constitutes development (or land use); divides up the municipality into land use districts and lists the land uses allowed in each district. It also separates all the land uses enabled in each district into permitted and discretionary uses; and sets the development standards (e.g., size of land and buildings, building heights, setbacks and site coverage) for each land use district. The LUB also outlines the requirements for a development permit application and timelines for decision; the process for appealing a development permit decision; and the process for amending the Land Use Bylaw. All amendments to the Land Use Bylaw shall be made in conformity with the provisions of the MGA and any applicable statutory plans. The Municipal District of Peace may, at any time, also initiate an amendment to the Land Use Bylaw. For more information about the Land Use Bylaw Amendment Process please click HERE.